Sunday is generally our day to restock the pantry. We alternate between the big store called Carrefour (here called a “hypermart” because, in addition to groceries, it has all kinds of other things – clothes, electronics, small appliances, cookware, etc., etc., etc. – vaguely like a Walmart) and a smaller grocery store in a nearby mall. Today, it was our turn to visit Carrefour. Singapore has two Carrefours. One is in Plaza Singapura, which is a big mall. The other is in Suntec City, a giant mall spread across four or five or six – it’s easy to lose count – giant towers. And today, we decided to visit the Suntec Carrefour for the first time. By the time we got there, it was way past lunch time, so finding something to eat was our first order of business. Food in Singapore is sometimes a bit of a contradiction. Places to eat are literally everywhere. But it can sometimes be tricky to find one – especially a specific kind – when you want it. Happily for us, the Suntec hawker center was the first thing we encountered. “Is this all Asian food? Does everything have rice or noodles?” Nancy asked. We hadn’t had the best luck ordering lunch at yesterday’s restaurant. Hong Kong style curry, with a big mound of rice. Plain rice isn’t her favorite (“I’m avoiding useless carbs”), and the curry was spicier than normal. At the hawker center food stalls, it is all Asian, ranging from Chinese through Indian and Vietnamese to Singaporean and on to Malaysian, Indonesian, and Phillipino. All including rice or noodles, with just a few exceptions: kaya toast. Prata – a Singaporean / Indian crepe, sometimes served with a bowl of curry sauce for breakfast. Chinese steamed dumplings. We settled on a lunch of roast duck breast with soup, long thin noodles (for long life! ), and a stem of lightly cooked yu choi. Delicious and only S$10 apiece. We took chopsticks but no forks. I could only see metal, western spoons to use for the soup. While I was standing in line at the drinks stall, Mr. Duck came out with Chinese spoons and took away the western spoons we had. He wanted us to enjoy his cooking with the proper utensils! Fortified with lunch, we continued our quest to find the giant Carrefour. 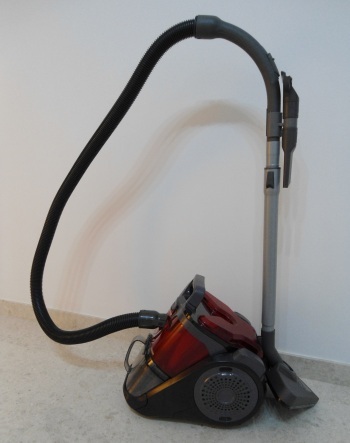 We came home with our groceries, a couple bottles of wine, and a brand new French- made vacuum (don’t get the other model; it’s made in China – yes, that’s exactly what our Chinese clerk said). When it’s turned on, it sounds like a small jet plane winding up for takeoff. But it’s a glorious red (not disgusting purple like on the box) – a lucky color for Chinese New Year and for all the year! I’m curious what you stock your pantry with n Singapore? Great blog! Thanks! Mostly stuff you’d recognize – milk (half gallons only, and expensive), cheese (very expensive), eggs (sold in packets of 10), flour, sugar, a few boxes of Indian spice mix (butter chicken, masala, …), a couple of bottles of sauce (oyster sauce, black pepper sauce, gung bo sauce), a mixture of Western and Asian vegetables. Our dinners are generally some kind of Western/Asian fusion.